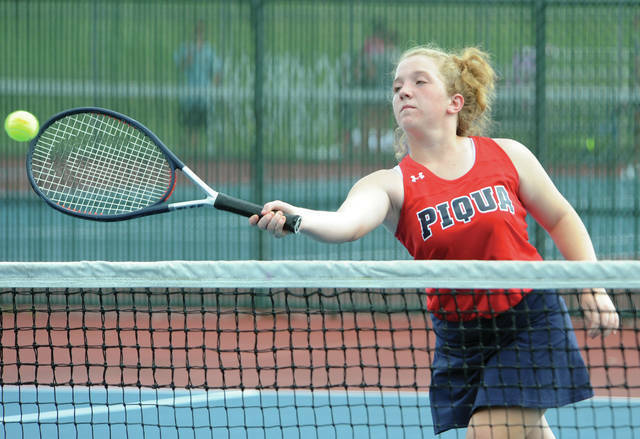 Piqua’s Cassie Arnett hits a forehand return in doubles action Tuesday. Piqua’s Izzy King keeps her eye on the ball as she hits a backhand Tuesday against Stebbins. Piqua’s Skylar Cain hits a forehand volley in a doubles match Tuesday against Stebbins. 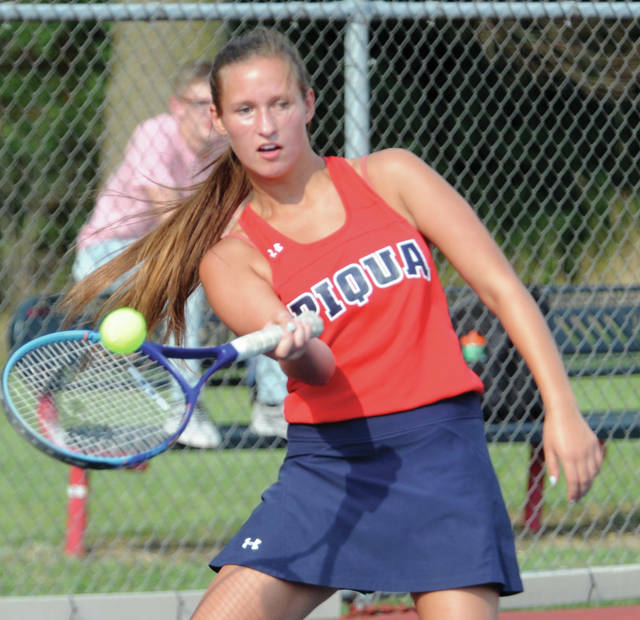 When Kyla Starrett took over the Piqua girls tennis program three years ago, the Lady Indians had to forfeit third singles in a number of matches. Three years later, they have gone from not filling the courts to having 20 girls on the roster and took a five-game winning streak into Wednesday’s match with Bellefontaine. Starrett began to see things change a year ago. The starting lineup includes juniors Alexa Knorr-Sullivan, Skylar Cain, Grace Ryan and Rikki Ramirez; sophomores Alexis Gastelu and Cassie Arnett and freshman Izzy King. The JVs include juniors Sache Marks and Madison Beaver; sophomores Chloe Barnes, Mattyson Dempsey, Oakley Gilmore, Alica Elliott, Courtney Elliott, Kylie Weber, Paige Stumpff and Shawna Gill; and freshman Madelynn Fisher and Lauren Hicks. During the win streak the doubles teams of Arnett and Cain and Ryan and Ramirez have been rolling through the competition and Tuesday’s 3-2 win over Stebbins was no exception. Arnett and Cain won 6-4, 6-1; and Ryan and Ramirez won 6-3, 6-4. That left Piqua needing one win in the singles match. Gastelu lost 6-1, 6-1 at third singles; while Knorr-Sullivan at first singles and King at second singles battled for more than two hours in the hear. Knorr-Sullivan was able to gut out a 7-6 (7-5), 6-4 win for the deciding point, while King had a strong rally in the second set before losing 6-2, 7-5. And, while the future is bright, Starrett admits the end of next season will be a tough one for her. 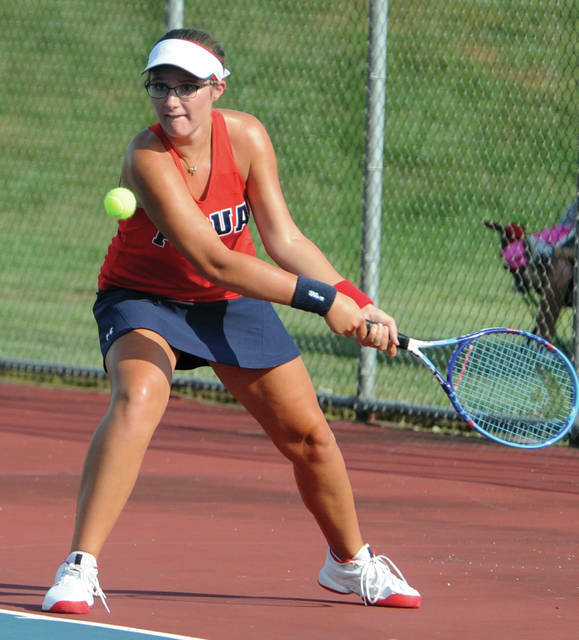 And have put the work in to reverse the fortunes of the Piqua girls tennis program. https://www.dailycall.com/wp-content/uploads/sites/30/2018/09/web1_090418mju_tennis_phs_cassiearnett.jpgPiqua’s Cassie Arnett hits a forehand return in doubles action Tuesday. https://www.dailycall.com/wp-content/uploads/sites/30/2018/09/web1_090418mju_tennis_phs_izzyking.jpgPiqua’s Izzy King keeps her eye on the ball as she hits a backhand Tuesday against Stebbins. https://www.dailycall.com/wp-content/uploads/sites/30/2018/09/web1_090418mju_tennis_phs_skylarcain.jpgPiqua’s Skylar Cain hits a forehand volley in a doubles match Tuesday against Stebbins.